Costs – What do you think tree owners in Charlottesville, VA pay for tree maintenance or removal? Learn more about average costs in the area. FAQs – The mountainous region of central Virginia is home to many species of tree wildlife. This means that your yard can support many types, but there are others you might reconsider planting for different reasons. Services – Need more information from a pro? See our list of professionals in the Charlottesville area. How Much Do Tree Services Cost in Charlottesville? With lots of history, and as the home to two former American presidents, Charlottesville, Virginia, is a wonderful destination to explore. Thanks to frequent rainfall and a humid climate, trees, shrubs and a variety of other plants grow well. However, they may still require professional maintenance from time to time. Discover what to expect when it comes to the cost of hiring professionals to trim and prune trees, remove stumps and remove trees. Trying to remove a tree from your own property can certainly be done on your own, but professionals will ensure that the process damages as little as possible in the surrounding area and keeps everyone safe. In addition, they can remove all of the wood after the fact, or they can chop it up and leave it as firewood. Either way, expect to pay between $424 and $558 to have a tree removed in Charlottesville, Virginia. A common misconception is that removing a stump is a lot easier than removing an entire tree, but it can be just as much of a challenge without the right tools. Professional teams will bring in large commercial grinders that eat away at the stump quickly and leave nothing behind. In Charlottesville, professional stump removal typically costs between $80 and $132. If you want to keep your trees in place but still ensure they thrive for the coming year, pruning may be a smart option. Tree trimming may also be necessary if branches are getting close to structures or even overhead power lines. 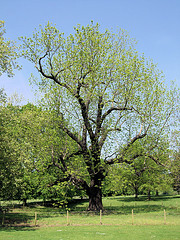 Professional tree maintenance teams can handle both tasks with ease, but they will charge an average of $647 to do so. Since Charlottesville is such a historic city in Virginia, there are a number of efforts in place to maintain the tree canopy and retain that welcoming, charming and traditional feel in the region. Whether you are a new homeowner in Charlottesville or you just have the desire to spruce up your backyard, find out more about the best trees to grow, what removal regulations are in place and how power lines can affect your planting decisions. In the past decade, Charlottesville has become an official Tree City of the U.S.A., and its residents have created a Tree Commission as part of the Urban Forestry Department in order to better maintain the existing tree canopy in the city. Despite all that, however, homeowners are still able to control what, if any, trees are removed from their private property. As long as the tree, its branches and the majority of its roots remain in your land, you can remove it as you see fit. The best time of year to remove trees is generally after the summer, in October, when professional services are in high demand, but before the first winter freeze sets in. Dominion Virginia Power is the primary electricity provider in the Charlottesville area, and it has a number of recommendations for property owners in the service area. In rights of way beneath transmission lines, it suggests planting shrubs or similar low-height plants because large trees are problematic and may need to be removed if within 25 feet of the overhead lines. In addition, Dominion Virginia Power reminds property owners that they need to remove limbs or branches that are trimmed by their professional teams that maintain the power lines. While the trees commonly associated with Virginia are grand shade trees, many residents are able to successfully grow a number of fruit trees as well. The key is picking varieties that will be able to withstand both hot summers and potentially freezing winters. Some of the best options include persimmons, figs, apples, pomegranates, pawpaw and Asian pear. Better known as the flowering dogwood, Virginia’s state tree is officially the Cornus florida. Characterized by red berries and white blossoms in the spring, these trees are a staple of the landscape in Charlottesville as well as the surrounding region. The flowering dogwood was designated at the state’s tree in 1956. 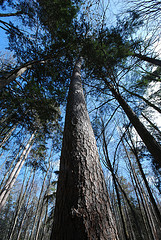 The Virginia Big Tree Database catalogs and records all of the tallest trees in the state in every species. While the majority of these record-breaking trees are not in Charlottesville, the city is home to a few trees on the list. Within city limits, you can find a Ginkgo biloba standing at a towering 102 feet and a bur oak that is over 70 feet tall. If it is little trees you are after, the city’s nurseries have lots of saplings to choose from. 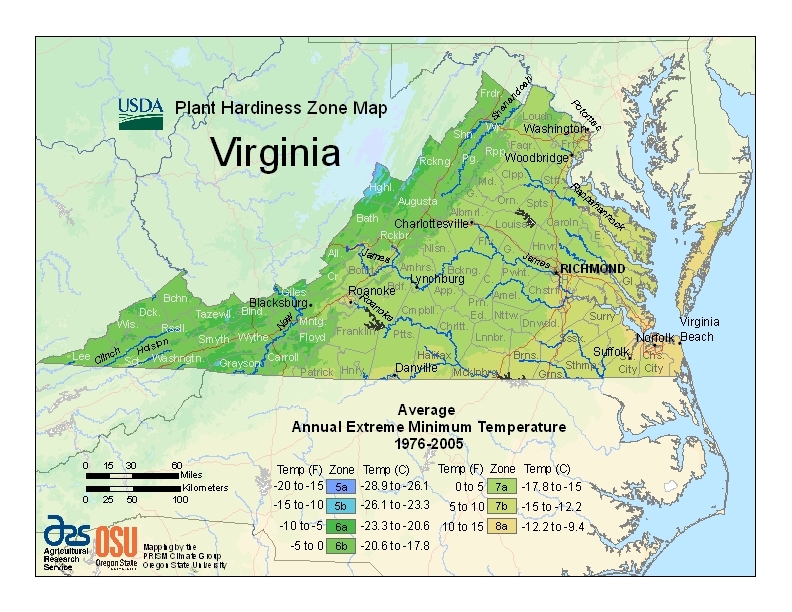 When choosing trees that thrive in Virginia’s climate, pay close attention to the USDA hardiness zone rating. Since Charlottesville has a rating of 7a, skip trees ranked lower than 4b or higher than 9a. Unfortunately, there are some pests, insects, diseases and fungi that you will need to watch for when growing trees in Charlottesville. A few of the biggest offenders include oak wilt, hypoxylon canker, flathead borers and gypsy moths.